Welcome to Hell! Hell's Missions is an optional perk of the clan that can earn you great rewards in the form of credits, items, power, and fun. It is a collection of missions that earn Plague Points, which are used as currency for rewards. This mission game is all about activity! Plague Points are cashed in for prizes like credits, items, or a RANK UP. Plague points are worth different values, however. The higher your rank in the clan is, the more your Plague Points are worth. 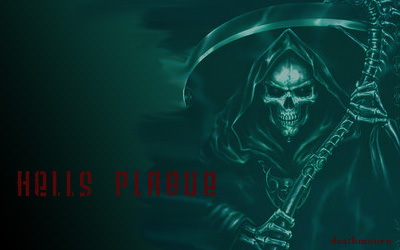 For example, a rank 4(Plague Victim) earned 5 Plague Points. When he cashes those 5 points in for credits, he gets 25 credits. Thus, a rank 1 will trade 1 Plague Point=5 credits. Contrary, a rank 3(Plague Survivor) will trade 1 Plague Point=6 credits, a rank 2 will trade 1 Plague Point=7 credits, etc. The rank 1s, Assistant Leader and the Leader earn the highest, and will trade 1 Plague Point=10 credits. RANK UP costs: each rank costs a number of points to rank up. You can still rank up other ways, but this is just another way to do it.NOTE:You must RANK UP 1 at a time, in order from rank 1 to 6. Meaning, you cannot simply pay 54 Plague Points as a rank 1 and become a rank 4. Also, you may only buy 1 RANK UP per week, so that no one can get too high too fast. Earning Plague Points: each mission earns different amount of points. All missions are weekly-based, meaning that each mission must start on sunday and be finished BEFORE the next sunday. The following is the missions and the points they earn.NOTE: Missions do not rollover. if you start a mission and do not complete it in a week, you must start that mission all over. Donating Credits-5% of your donation is transferred into credits.for example,500c's X 5%=25 Plague points earned. Special Missions-missions that are different from normal missions and only last 1 week. points named later. YOU MUST DONATE 100c's TO CLAN BANK TO BEGIN HELL'S MISSIONS. You only have to pay this once, when you begin participating in missions. You do not pay this per mission, just at the first one. You do not earn Plague Points for this original donation. Plague Points are tallied at the end of the week(Sundays), meaning if you finished your mission early, you will not get the points until the end of the week. Upon finishing your mission, message either Guitarhero and/or junglek9, stating which mission you completed, and how many points you earned.If you do not do this, it is possible that your points will not be tallied for the mission you did. When you decide to cash in your Points, there will be a sticky thread called Hell's Missions that you post in. post how many points you want to cash in, and what reward you want. Your points will be deducted and your reward will be sent to you. DO NOT CASH IN YOUR POINTS OR TAKE YOUR REWARDS FOR YOURSELF. We will handle that part. If at any time you take your reward for yourself, that is take credits or items without notifying the above people, you will be deranked/banned/kicked. Do not post a thread about wanting a loan. there is a sticky for this. if you make a thread for wanting a loan, you will lose all your Plague Points and possibly be deranked/banned/kicked. Do not ask for a loan if you are Rank 1 or Rank 2. deathmourn is upset about this, because low ranks have scammed him before. If you want a loan, you must prove your trustworthiness by ranking up. IF YOU ASK FOR A LOAN AT RANK 1 OR RANK 2, YOU WILL LOSE ALL YOUR POINTS AND BE DERANKED/BANNED/KICKED. This page was last modified on 8 February 2019, at 16:38. This page has been accessed 5,791 times.